The next best to “fresh” is the “dehydrated” where everything in the herb remains intact, only the water content is removed. The finest quality herbs that are used in these powders are pure and unadulterated. Therefore, wherever practical, it is beneficial to use the dehydrated herb. When juices, milk, yogurt or rose water is added to these powdered herbs they are “hydrated” and the fullest benefits of these natural products in their entirely may be had. Perhaps not as fresh as nature intended, but closest to nature, the next best thing. An ancient recipe, unique in its properties, for a smooth, radiant and brilliantly polished skin. It comprises 52 herbs including Turmeric, Fennel Seeds, Star Anise Fruit, Lemon, Orange, Sandalwood, Fenugreek, Manjistha, Cinnamon, Nutgrass Tubers, Clove, Nutmeg, Marigold, Marjoram, Poppy Seeds, Camphor and Saffron which leave the complexion soft, glowing and gently polished. How to use: Take half teaspoon and mix with yoghurt or rosewater to make a creamy paste. Useto wash face. Rinse well. Product Benefits: Forest Essentials Soundarya is a powerful exfoliating treatment that stimulates the underlying tissues of the skin. 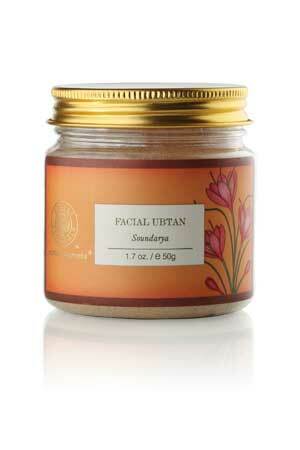 By its revitalizing, refreshing & refining actions, this 'Ubtan' gives a natural glow to the complexion. Its regular usage prevents the occurrence of premature fine lines, improves skin texture, giving skin a smooth radiant finish. Hundreds of new beauty products come onto the market every day and huge numbers of “natural” lifestyle stores are coming up as people have begun to realize that natural is good. However, although there are many more options now for skin care, there is also a lot of confusion about what is truly good for the body and skin. Fly by night operators, who manufacture out of sheds with no hygiene standards, or companies who churn out substandard products preferring to spend on huge advertising budgets, mislead customers. Real Milk, Almonds and Honey cannot be poured into a soap to make your skin like a film star at ten rupees. Unfortunately we have had many millions of people in our country, who for many years have been fed on this, and have believed it to be reality. Happily now we are in a changing environment. People are much more aware, have more exposure and have begun to question what they don’t understand. If we are to believe many manufacturer’s claims then their products are made with “exclusive” formulas, rich in pure sounding ingredients like “Botanicals”, “Bio minerals”, “Enzymes” & “Extracts”. While a few of them do contain authentic natural ingredients, the vast majority and their advertising copy, fail to mention the many synthetic & chemical ingredients that also go into these products and therefore into our skin. Ayurveda sets much higher standards than “acceptable’ levels of Government regulations, because its basic view on health, and its concept of “natural” is at once more encompassing and refined. Also having ‘tested’ its theories for 6000 years, directly on human subjects, Ayurveda may justifiably claim to know the long term effects of its treatments and products. Adulterated oils with synthetic perfumes are available everywhere. Soaps are made from waste machine oils that have been deodorized and bleached, filled with stone fillers to keep the prices down. If you want to use the purest cold pressed oils, made from organically grown sweet Almonds enriched with pure essential oils to nourish your skin – then you have to be prepared to pay the extra cost involved in the making of a high quality product. Although , we get most of our nutrition orally , the skin ingests nutrients as well. Infact, unlike the food we chew and swallow before it is absorbed, creams lotions, and oils, bypass the digestive process and go full strength into the blood stem. Like all ingested substances they either can become raw material for building new body cells and tissues- or potent toxic material unbelievably harmful for your body. Think of your beauty products, not as cosmetics, but as food. If you cannot eat it, do not use it on your skin. That is the Ayurvedic standard for pure and natural. It is important to read the labels of your beauty products. It is important to know that organically grown unprocessed cold pressed oils, have the highest levels of nutrients for your skin. Skin is alive and chemicals cannot give back life into the skin. Beauty products made of “living’ substances such as plants or their extracts, are balanced by Nature and contain the vibratory energy that constitutes life. By plants, we mean all forms of vegetation, including Trees, Flowers, Fruit, Vegetables, Herbs and Spices. These living substances contain all the purifying, nutritive and balancing properties necessary to nurture the skin and slow down the ageing process . They are the perfect foods for the skin. At Forest Essentials we source our ingredients with great care. From our organically grown Cold Pressed Oils, to our raw and unprocessed Cane Sugar to our steam distilled pure Essential Oils. Everything is made in the traditionally old fashioned way, according to Ayurvedic tenets, and wherever possible, by hand. We have the highest quality control standards in our factories, certified by GMP standards. It is time to say Goodbye to harsh, synthetic Scrubs, lifeless Lotions, and Soaps made from waste machine oils. Make space on your bathroom shelves for a gourmet feast for your skin- with Forest Essentials. The purest - The most nutritious - The very best.